The property is set within its own grounds right next to the secluded and sandy Calla Beach. With panoramic views of the Atlantic Ocean. Calla Beach House is an ideal base to explore the magnificent Wild Atlantic Way as well as experiencing some of the most breath-taking scenery in Ireland. • Well equipped kitchen diner. • Living room with TV/DVD. • Reading room with direct access to garden. • 1 double bedroom en suite. • Bathroom with overhead shower and toilet. 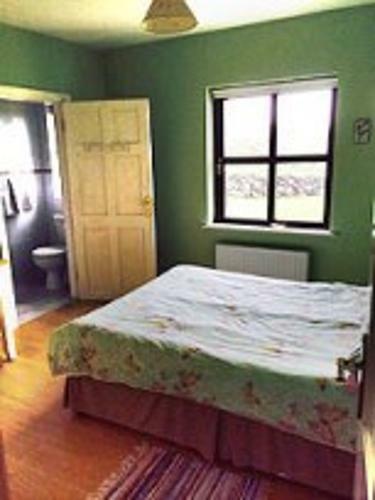 • 1 large Double bed room plus double sized sofa bed (Could sleep 2 adults and 2 children). • Bathroom with shower and toilet. • Central heating throughout the property. • Oil burner in Kitchen. • Electric fire in living room. • Travel cot and high chair on site. • Comfortable sitting room with a leather suite, TV/DVD radio. • Fully fitted kitchen with all mod cons including fridge freezer, washing machine & dishwasher, slow cook and microwave. • Hair driers in both double bedroom. • There is a patio door to the rear of the house and this leads onto the garden. • Tumble drier on site. • Parking on site for several cars. • Clifden with its many craft shops, restaurants and bars and sample the atmosphere at the annual Clifden Arts Festival. • Explore Roundstone and the fabulous beaches at Dogs Bay and Gurteen. • Enjoy a round of golf at the Ballyconneely Golf Club. • Take a sightseeing drive to the Connemara National Park, Kylemore Abbey, Killary Harbour, Leenane and Westport. 350 – 700 euros per week. We regret that pets and smoking indoors are not permitted.